Deciding to live in a small space in an urban environment is a great first step towards reducing your carbon footprint. Making the move, however, may present some frustrating day-to-day living challenges — especially when it comes to finding a place for all your furnishings. Danish designer Tom Rossau solved his own dining and entertaining troubles in his tight flat home by designing this dual-purpose bamboo Convertible Table. 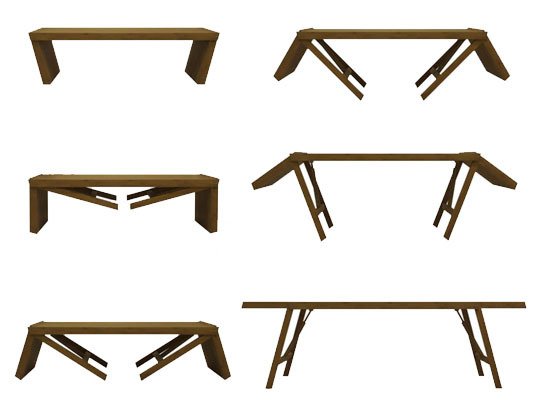 The diminutive coffee table is capable of transforming into a large 10 person dining table for when guests come over. Although the concept is smart and the overall design is quite appealing, there are still some questions left unanswered. The Convertible Table changes in size quite a bit when transformed, so the dining table most likely demands a space away from the living room sofa for proper use. One must also consider dining chair storage while the table is in coffee table mode, and the bottom of the legs on the coffee table may lead to grime covered ends on the dinning table, since this part of the table will spend some time on the floor. All things considered, Convertible Table seems to be a solid choice for those of who predominantly sit in front of the television for dinner, have flexible space to set up the dining table, don’t mind a little wear and tear, and want an option for inviting dinner guests over on occasion. Are these available to buy yet? I want one of these! Is it in production? Deciding to live in a small space in an urban environment is a great first step towards reducing your carbon footprint. Making the move, however, may present some frustrating day-to-day living challenges -- especially when it comes to finding a place for all your furnishings. 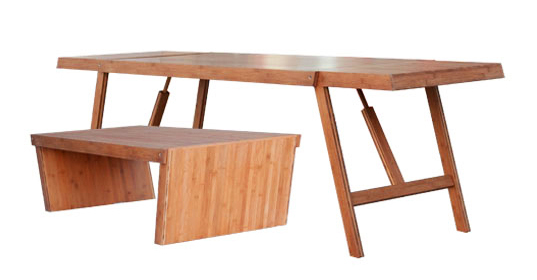 Danish designer Tom Rossau solved his own dining and entertaining troubles in his tight flat home by designing this dual-purpose bamboo Convertible Table. The diminutive coffee table is capable of transforming into a large 10 person dining table for when guests come over.